Wrong translation of "Greek Modern"
In language-selector the translation of "Ancient Greek" and "Modern Greek" as "Αρχαία Ελληνικά" and "Σύγχρονα Ελληνικά" respectively makes those language entries appear in two separate places in the language list and in a position where Greek people don't expect them to be. I'm not sure where this language list translation is coming from, so I'll file it under language-selector, waiting for someone who knows. Could you please show in a screenshot where it also says Ancient Greek? It is essentially the same screenshot as you already did, but it shows the three options that relate to the Greek language (shows only two now). Nope, no Greek (Ancient) found in the languages, not anymore at least! It says Ελληνικά Σύγχρονα (=Greek Modern), which fixes the first part of the bug. The reporter requested also to remove "Σύγχρονα" (=Modern). 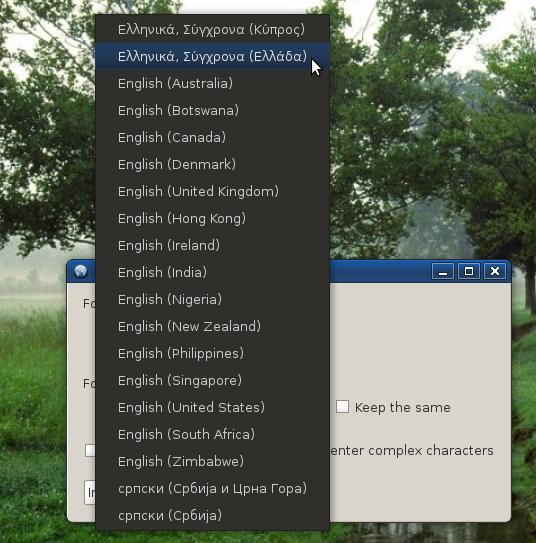 Not a bug in language-selector. Please fix the translation directly in Launchpad. We will take new translations from there. When done, please leave a note here. iso-639: Template "iso-639" in Ubuntu Jaunty package "iso-codes"
iso-639-3: Template "iso-639-3" in Ubuntu Jaunty package "iso-codes"
Is this issue still unfixed? Still exists in 10.04 lucid and in latest upstream version 3.16. We just asked the translator about his stance on this. I'm personnally balanced. One one hand, the standard includes the word "Modern" and I don't see any reason to drop it....unless the standard itself drops it. Which is indeed why my French translations says "Grec moderne (après 1453)". let's way for the translator's answer. What we want here is to update the upstream translation for a package that is managed by Debian. We got agreement at that point for the translation change, but it appears that the change was not committed. There is now a second (Greek) Debian developer that can help on this. Can you locate the discussion on the ubuntu-gr/debian-l10n-greek mailing list and revive it? Serafeim or Kostas should be able to commit this change directly. I fixed the *translation* in git, so it will be in the next release. However, as already said many many times, I won't fix the English version: if you want it to be changed, then have the ISO 639 standards changed. > I fixed the *translation* in git, so it will be in the next release.